Lucky Betty & Cat! I’ve just published a French/Spanish and an English/Spanish version of Home, the first book in the series. Although I don’t speak Spanish, a young Spanish teacher living in France who asked if I had Spanish books available contacted me. I did not. A few months later, she contacted me again and suggested she do one for me! After giving it some thought (it’s complicated because how do I judge whether she got the tone right, or is really good at interpretation; after all, my name is on it), we went ahead. I knew a Spanish person whose opinion I respected, and who could confirm that the tone was right, and so via Skype and email we went ahead. A true sign of the times. I now feel I know Rocío quite well. Having gone through the self-publishing mill together I feel we have a shared bond and am thrilled with her enthusiasm and her contacts! And I’m confident that the tone is perfect! 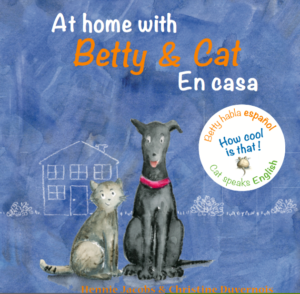 At home with Betty & Cat En casa and Chez Betty & Cat En Casa is now on sale in the boutique of Toulouse’s natural history museum, as well as bookstores in and around Toulouse. The book has crossed the border into Spain and is being used in at least one classroom there (a first; most teachers are wary about using them in class since the books aren’t translated) as well as in some bookstores. This entry was posted in Nieuws by Hennie Jacobs. Bookmark the permalink.